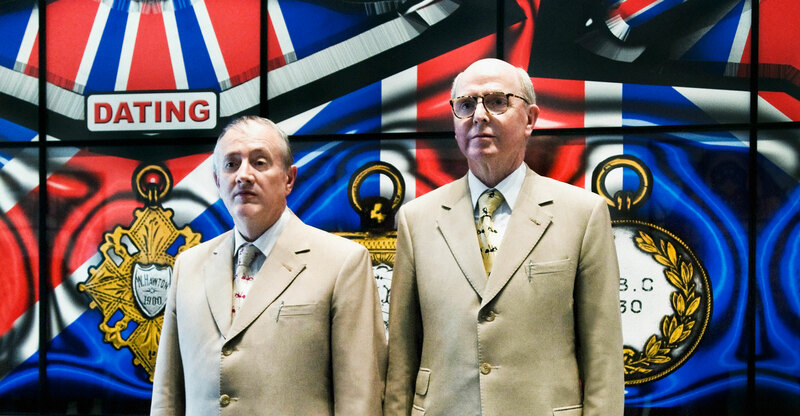 Gilbert and George, you’ve made your own likenesses an integral part of your work. Did you ever worry that you would look like egocentric maniacs? Gilbert: It was an amazing adventure in the beginning. We had to find our way throug­h this jungle because what we did was totally unknown: this whole idea of making ourselves the center of our art and trying to leave something behind that was totally unusual. George: In fact, when most people see our pictures they think the images are talking about themselves rather than us. They see their own lives in relation to the pictures. Gilbert: And that’s what we like because we like art that asks questions, that provokes questions. That’s what is important for us. We don’t want to do art that everybody comes and says, “Oh, wonderful,” and then they go out and forget it forever. Would you say the art world has accepted you by now? George: No, no we are not accepted! We have a huge following in the general public, but in the media and within the profession there is always a slight problem. A lot of unknown artists say that art can stand on its own and doesn't need an audience. Would you agree or are these merely the justifications of the unsuccessful? Gilbert: We don’t believe that. We don’t do art for the few. We need the feedback from the audience. George: We only believe in art for all. We believe that the artist should use a language that can reach people in any part of the world. Do you believe that a true artist has to be poor? Gilbert: We are still poor. Gilbert: We are, very. It’s simple, we only pay ourselves a salary. We have a company and we have a salary where we get very little money, only like forty thousand pounds a year. And the rest you invest into your art? Gilbert: The rest we spend making shows. We never have anything left over. We did big shows in China and we paid for it; we did big shows in Russia and we paid for it. We also did a big catalogue that we subsidized for 300 thousand pounds. So would you say that this freedom from materialism is a conscious personal decision in order to remain flexible? Gilbert: I mean, why do we need money? We don’t have babies, we don’t have bicycles, we don’t have a car, and we don’t have a mobile phone. George: We don’t have a holiday house, we don’t have a yacht – we don’t have anything. We need very little for ourselves. Do you have your own art in your own apartment? George: No, we never did. You have been putting images of yourself into your art works since the 70's. Has the digital revolution changed your process drastically? It must be a lot easier with a computer. Gilbert: It always was done by hand and it still is done by hand. Even when you take a negative image – when you have a camera and you press a button – you don’t take a photograph, you take a negative; you take the reverse. George: It is exactly the same; we are trying to eliminate the artistic hand from our work from the beginning. In art we use lenses to make our artwork even larger. And it seems that is exactly what the computer was designed for us to do. So you have profited from the technical advancements after all. Gilbert: It’s opening up new ways of expressing ourselves that we never would have had before. But in the end it’s very simple: everyone has a computer, but they are not doing what we are doing with it. George: When we started working with computers it was like a continuation of the darkroom process, because the language is the same: levels, layers and things. Long before we had a computer, young people asked, “Which computer are you using?” before we were even using one. The young people get so excited about computers, but they’re not able to design one postcard that they can sell. Do you see computers responsible for less interest in art, or rather a way we can now view and produce images even more? George: You have to realize that in the 19th century everybody could sketch. Everyone could paint and it was completely normal. Every lady was able to sketch. And then in the 20th century every tourist from all over the world was able to take photographs, but it meant nothing. No one wants to see the photographs of a tourist. Gilbert: Everybody is taking images with their mobile phones. They take it, they look at it, and that’s finished. George: We are not doing that. We are doing something entirely different. Gilbert: But we always work. We make images all the time. George: It’s always research, always continuing, nonstop. Since you work so much together, how is your relationship? Is it ever difficult since you spend so much time together? George: Why should it be difficult? Often journalists ask us if we argue or we fight. We think anyone that we know that argues or fights should be ashamed of themselves.